PANJIM: As the definition of disability refers to as a limitation on a person’s physical functioning, the stigma behind such a barrier was broken at the Shyama Prasad Mukherjee Indoor Stadium, where specially-abled athletes rolled their wheels in a bid to show that they are not confined to their inabilities. Around 16 players including a female athlete rolled their wheels on the indoor basketball stadium in the an exhibition match to bring down the curtains workshop on wheel chair basketball. Despite using the wheelchairs for their mobility on the court, the athletes showed same determination and grit as they exhibited their talent and skills on Tuesday. The workshop was organised by Wheelchair Basketball Association of Goa (WBAG) and Sports Authority of Goa (SAG) in collaboration Basketball Federation of India. The two days camp saw the athletes learn the wheelchair skills, ball drills and then the basics of offense and defense skills. 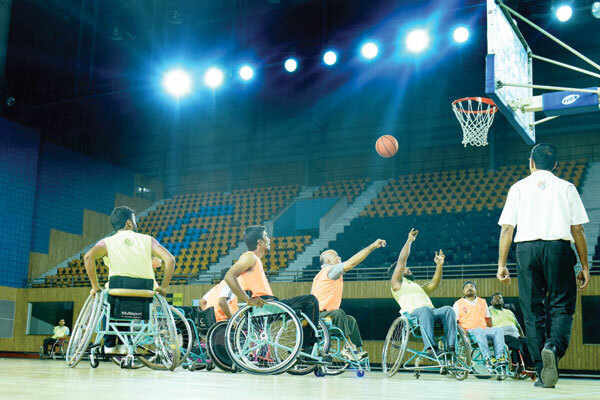 “We have selected 10 players from this sixteen member team who will now represent Goa at the fifth National Wheelchair Basketball Championship to be held at Tamil Nadu.” Said WBFI General Secretary Kalyan Rajaram. “We will be working with the local state basketball association for any of our future camps or for them to promote more players from Goa. We will be supporting them in all the possible ways,” added Rajaram. Rajaram revealed that the stadium had been given free of cost by the SAG along with accommodations to all the players at the youth hostel. As the players rolled the wheels on the court in bid to display their talent, spectators were left rather emotional watching the players break their barriers and chase the ball on the court. “They are already winners” she said.